Our Bachelor of Commerce (Honours) (BCom) program will enhance your understanding of key business functions and current systems technologies. You will be equipped with strong employability skills and the foundations for excellence in managing business corporations upon graduation. During your studies, organizations are examined from a number of perspectives, including how they are managed and the changing environments in which they operate. National and international contexts of business are explored, along with relevant issues facing managers in business, labour and the public sector. Our university focuses on innovation and market-oriented programming. Program advisory committees and accrediting bodies support this focus, resulting in curriculum changes that ultimately enhance program outcomes. Therefore, from year to year, minor modifications may be made to courses, program maps and/or program progression requirements. 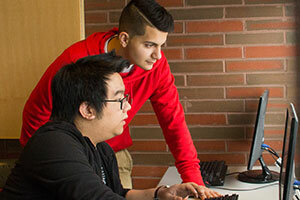 To be eligible for the honours Bachelor of Commerce degree, students must successfully complete 120 credit hours, including all courses outlined in the following program map. For further program information, please visit the university's Academic Calendar. See major-specific pages for program maps tailored to each major.